Energy use shifting in U.S.
Last week the U.S. Energy Information Administration (EIA) reported that space heating and cooling now account for less than half of energy consumption in U.S. homes. Forty-eight percent of energy consumption in U.S. homes in 2009 was for heating and cooling, down from 58 percent in 1993. “Factors underpinning this trend are increased adoption of more efficient equipment, better insulation, more efficient windows, and population shifts to warmer climates,” the report states. More proof that upgrading insulation and installing new windows saves energy while improving the comfort of a home. And more reason for Chelan PUD to promote its program offering rebates on insulation and windows. While energy used for space conditioning has declined, energy consumption for appliances and electronics continues to rise, the report notes. Although some appliances that are subject to federal efficiency standards, such as refrigerators and clothes washers, have become more efficient, the increased number of devices that consume energy in homes has offset these efficiency gains, EIA states. Non-weather-related energy use for appliances, electronics, water heating and lighting now accounts for 52 percent of total consumption, up from 42 percent in 1993. Chelan County PUD will begin offering rebates on energy-efficient appliances in April 2013. The shift in how energy is consumed in homes has occurred even as per-household energy consumption has steadily declined, the report notes. Read a report summary here. Getting new games for Christmas? Hoping for a tablet or TV under the tree? You’ll save on your electric bill by purchasing products with the ENERGY STAR label. And once you have them at home, you’ll save even more by remembering to turn them off when not in use. Much of the electricity used by home electronic equipment is consumed when the products are turned off. That’s because they’re not really “off” – they’re in standby mode, using electricity to power features like clocks, remote controls and channel/station memory. ENERGY STAR qualified home electronics products in the “off” position use up to 50 percent less energy than conventional equipment, without sacrificing any important features. You save on your energy bills and reduce energy waste. According to the Environmental Protection Agency (EPA), the average home has one DVD player, three phones and two televisions. Televisions are typically larger, in use more hours each day, and offer more vibrant pictures and advanced features than ever before. Three factors influence the increased amount of energy consumed by televisions: screen size, resolution, and display technology. A useful rule of thumb is that power consumption is around one third of a watt per square inch of screen area. Thus a 42-inch TV will use around 70 percent more power than a 32-inch one. EPA’s ENERGY STAR specification for televisions establishes stringent requirements for energy use. Televisions that earn the ENERGY STAR are up to 30 percent more efficient than standard models by saving energy while they are on and when they are off. The current generation of gaming consoles is represented by the Microsoft XBox 360, Sony Playstation 3, and Nintendo Wii. Because these devices can be switched on for long periods, the electricity cost of using them can add up. During play, the XBox 360 uses 180 watts; PS3, 190 watts, and the Wii, only 18 watts. In standby mode, all three use only 2 watts of power. 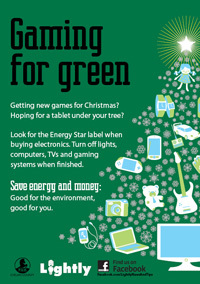 Bottom line: Look for the ENERGY STAR label when shopping for electronics. And remember to turn electronics off when not in use. A helpful brochure from ENERGY STAR is available here. Vampire power, also known as phantom load, is the electricity that electronics and appliances use while they are turned off or in standby mode. While it may seem like just a small nibble in your home energy consumption, vampire power quickly adds up to be a significant drain nationally on energy resources. Standby power is beneficial when used in remote controls, clock displays, and timers. But too often it’s simply wasted because cell phone chargers, iPod chargers, power adapters and other devices not being used are left plugged in. According to Energy Star, the amount of energy used by products when they are in standby mode is significant. The average U.S. household spends $100 per year to power devices while they are off (or in standby mode). On a national basis, standby power accounts for more than 100 billion kilowatt hours of annual U.S. electricity consumption and more than $10 billion in annual energy costs. • Look for ENERGY STAR when shopping. All ENERGY STAR qualified products are among the lowest power consuming in their category in standby mode. • Enable the ENERGY STAR power management settings on your computer and monitor, so they go into power save mode when not in use. • Use a power strip as a central “turn off” point when you are done using equipment, which completely disconnects the power supply. You can use one for your computer and all peripheral equipment, and another for your home electronics (TV, VCR, DVD, stereo, gaming). Keep in mind though that if you’ve set a timer to wake up a product, such as programming a Digital Video Recorder (DVR) to record a program, then the product must remain plugged in (and able to draw standby power) to function as intended. • Unplug your chargers: cell phone chargers, camera chargers, battery chargers or power adapters, etc. These are drawing some amount of energy even when not in use (and even when not connected to an end-use product). 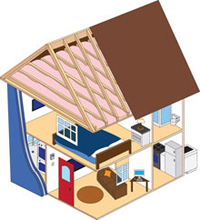 Looking for help finding ways to save energy in your home? Try our House of Savings and lower your energy bills. The House of Savings feature on Chelan PUD’s website provides a virtual walk through a typical home. Place your mouse over a feature in the house, click, and a pop-up box provides tips. Hover over the refrigerator, for example, and you’ll be advised to set your refrigerator between 37 and 40 degrees (F), and clean refrigerator coils. The pop-ups also provide links to related information. Open the door and step inside! And remember, conservation staff is available to help with specific questions about your home. Call us at (509) 661-8008 or email conservation@chelanpud.org.